ESEQuant TS2 Next-generation technology for point-of-need tests The ESEQuant TS2 is a small, easy-to-use fluorescence measurement system for isothermal nucleic acid amplification and fluorescence analysis in other applications. The instrument is extremely sensitive, robust, and cost-effective. Utilizing a fluorescence detector based on modern microsystems technology and state-of-the-art light-emitting diode (LED) and filter technology, the sensitivity of the tube scanner is comparable to top-of-the-range commercial spectrophotometers. 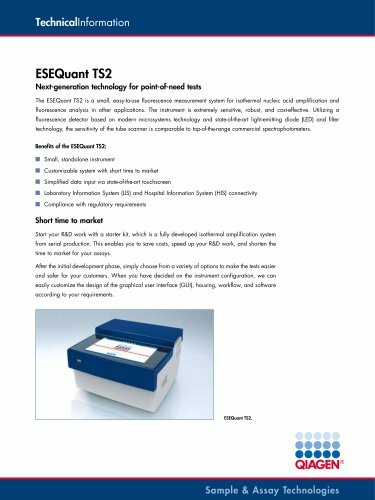 Benefits of the ESEQuant TS2: ■■ Small, standalone instrument ■■ Customizable system with short time to market ■■ Simplified data input via state-of-the-art touchscreen ■■ aboratory Information System (LIS) and Hospital Information System (HIS) connectivity L ■■ Compliance with regulatory requirements Short time to market Start your R&D work with a starter kit, which is a fully developed isothermal amplification system from serial production. This enables you to save costs, speed up your R&D work, and shorten the time to market for your assays. After the initial development phase, simply choose from a variety of options to make the tests easier and safer for your customers. When you have decided on the instrument configuration, we can easily customize the design of the graphical user interface (GUI), housing, workflow, and software according to your requirements.